In terms of protocol and images, Chinese President Xi Jinping’s visit to the United States last month was seen as a success from the Chinese perspective, especially given that it took place immediately after the visit of a highly popular Pope. What mattered most for China was that Xi be treated with the respect a great power deserves and this was the case. From the American perspective, the goal was to get visible results on issues exacerbating security tensions. And while some progress was made most observers are taking a wait-and-see attitude. Xi’s U.S. visit represented an interaction between two great powers, each with its own insecurities. Although public emotions have been largely driven by foreign policy issues, most of the discussion was shaped by economic concerns. China is in the midst of an economic slowdown that threatens its prospects for joining the ranks of developed countries while the U.S. is worried about losing its status as the dominant economic power. China is now the largest global economy in terms of purchasing power parity. Thus it is not surprising that Gallup polls show that the majority of Americans believe that China is the world’s leading economic power, and with this perception comes many over-hyped fears. Yet the Chinese overwhelmingly see America as the world’s leading economic power — and they are right. A country’s capacity to deal with foreign policy and security issues is determined more by its per capita income level than by the size of its economy. China now ranks about 80th globally in per capita income and is the first developing country to become a great power. This explains its reluctance to assume the responsibilities expected of a great power. The U.S. suggests that China should take on more responsibilities, while Beijing maintains that any change in the international order should be based on the new economic realities. These nuances are conveyed in China’s official statement on Xi’s visit, which covers 49 points. It begins with the headlined theme for the visit — “The new model of major country relationship between China and the U.S.” — a characterization that Washington does not ascribe to. Toward the end, cybersecurity (a major focus for the U.S.) comes as issue number 48. This ranking illustrates the relative objectives and insecurities on both sides. The U.S. perspective is recorded in three official documents covering 42 specific points. The first subject in the first statement is Afghanistan and peacekeeping, signaling America’s continued preoccupation with security and the Middle East, followed by bilateral relations where cybersecurity is prominent. The major achievement from the U.S. perspective is getting China to acknowledge that while cyber espionage for security purposes is acceptable, it should not be used to secure economic advantages. The second statement covers U.S.-China economic issues encapsulated in 27 points, ranging from international financial institutions to protection of intellectual property rights. Climate change stands out in being addressed in a five page separate statement. Clearly, the White House sees Xi’s visit as a means to use China’s commitment to climate change to push the agenda at home and abroad. How likely is it that the promises on the two key areas of cybersecurity and climate change will be honored? The answer lies in the role that economic pressures will play over the coming years. China’s willingness to commit to climate change goals and put in place a cap-and-trade regime reflects in part domestic political demands from a rising middle class that is no longer willing to tolerate the environmental degradation that came from unbridled rapid growth. But China’s agreement to commit to carbon emission ceilings by 2030 also comes from the practical realization that the energy intensity of its growth will have peaked by then, given the increasing dominance of services over manufacturing. Thus there is a high probability of China achieving its climate change objectives since, unlike in the U.S., there is no disagreement among its leadership about its scientific basis. As for cybersecurity, China sees its challenge as overcoming the middle-income trap by moving to a more technologically advanced economy. Very few developing countries have succeeded and those that have managed it, such as Korea and Japan, did so through indigenous technology. Theft is a tempting option that has driven success among many great powers at a similar stage in their development. Ironically, the U.S. is seen as a prominent example, having stolen the blueprints for the power loom from England to launch its industrial revolution and key patents from Germany after World War II. If realized, U.S. efforts to get China to differentiate between security and economic objectives as part of cyber theft would be a big achievement, but the likelihood of success is low given China’s view that these two objectives are interrelated. The real barrier separating China and the U.S. is the lack of trust. Pew surveys show that 55 percent of Americans have an unfavorable view of China. Among Asians, 84 percent of the Koreans and 68 percent of the Japanese have a favorable view of the U.S., compared with only 44 percent of the Chinese. From this perspective, perhaps years from now the chief outcome of Xi’s visit will come from having designated 2016 as the China-U.S. Tourism Year. Regarding economic relations, Xi’s visit signals that future tensions will be less about exchange rates and trade balances and more about technology transfers and market access as a rising power tries to close the gap with the leading economic power. Thus the bilateral investment treaty that China is now negotiating with the U.S. rightly represents the shift in the focus of attention. Yukon Huang is a Senior Associate at the Carnegie Endowment and a former World Bank Country Director for China. A version of this article previously appeared in Financial Times. 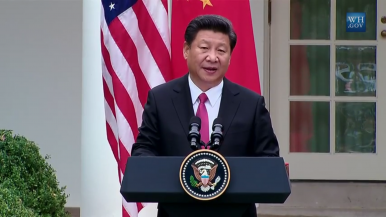 At a meeting with U.S. and Chinese CEOs, Xi addressed fears that U.S. companies are no longer welcome in China.